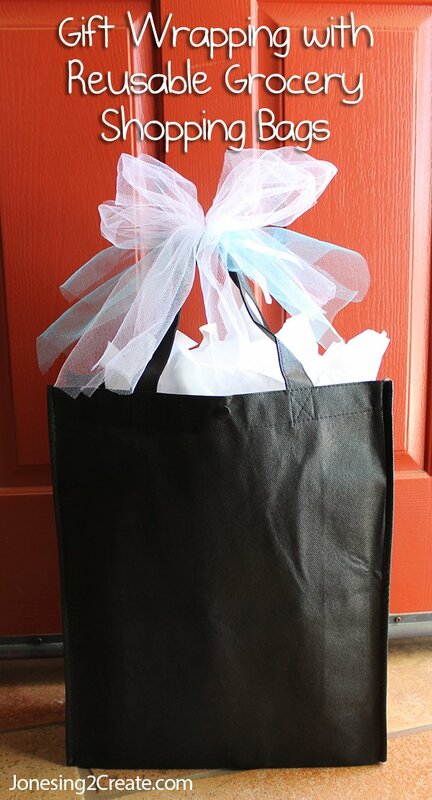 Beside being super yummy and healthy, farm fresh eggs are also perfect for decorating! 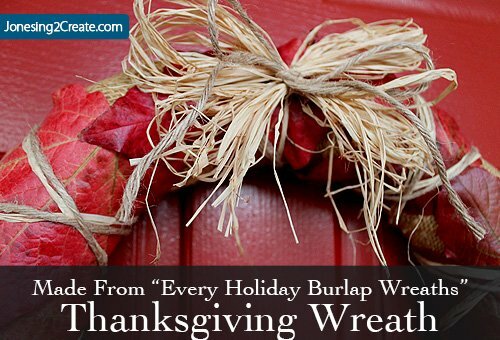 I love their natural earthy colors, their texture, and their smooth oval shape. They have this wonderful ability to make the objects around them feel softer and warmer. But before you use them, you will of course have to blow them out. Luckily I have found some tricks to make this easier! The other month I lucked into some farm fresh eggs when I paid a visit to the Big Red Barn where my mom sells a lot of the furniture she repurposes. I wanted to pick up a potting table for my back patio and they have several really, really cute ones there. Plus my kids are crazy about the place. They love to see the barn and the old tractors, but they especially like to visit the chickens and the turkey. And if my mom is there she watches the kids while I get to look around! She buys the kids goodies like kettle corn and fresh lemonade, and they are in total heaven while I get to shop. Yippee!!!! I’ve picked up some of my favorite things over there and you can’t beat the prices. This time my kids spent forever down with the chickens. Michelle, the owner, later sent us home with a dozen fresh eggs. She surprised us by also sticking in an egg from their miniature hen and one from their turkey! My kids were totally fascinated. I had a hard time keeping them from loving the eggs too death. The eggs were so gorgeous and I loved the size differences. I just couldn’t crack them open, so I decided to blow them out. Making the Hole in the Egg: The idea of chipping out a hole scared me too death because I only had one turkey egg and didn’t want to crack it. Plus the shell was pretty thick and I just knew it was going to take forever. So instead I used my cordless drill with a bit that would make a hole small enough not to be too obvious, but big enough to allow me to blow the egg innards out. I secured the egg in place by sticking it in an egg carton and then gently drilled a hole out of the bottom and the top. You will want a bigger hole on one side for the egg guts to come out of and a smaller hole on the other to blow into. It works great and there were no cracks! 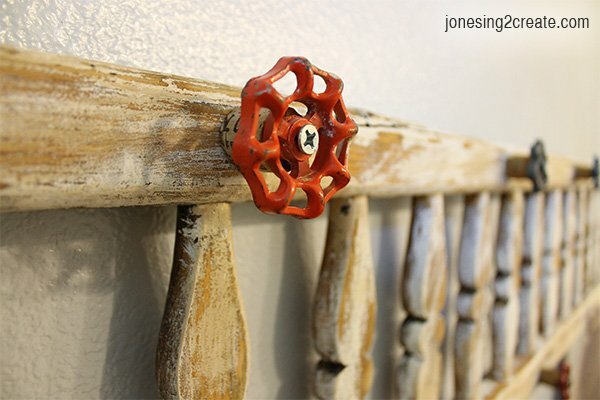 If your drill bit keeps sliding around while you are trying to drill it, just use some masking tape on top of the egg where you will be drilling. The tape will keep your bit from sliding. The Yolk: The hardest part is getting the yolk out. 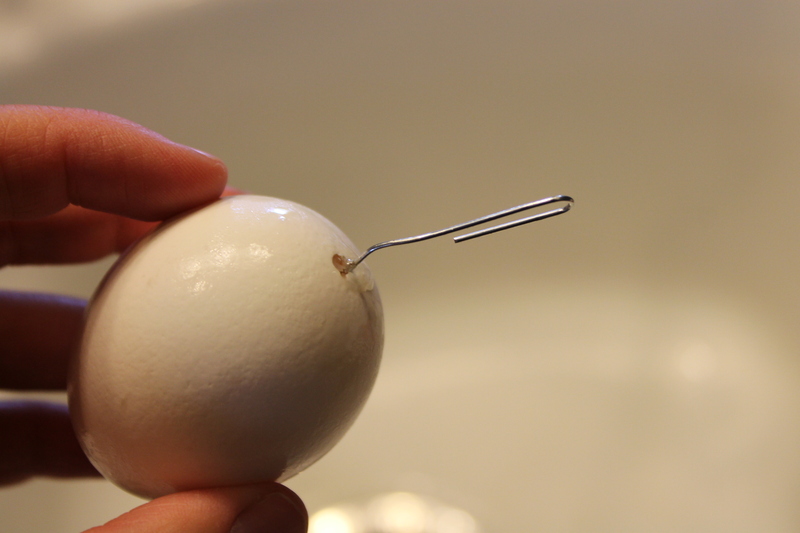 So I made it easier by unbending a paper clip and sticking it in the hole up inside of the egg. I then used the paper clip to scramble the egg up inside. It made it so much easier to blow it out! It is also easier to get the insides out if the egg is at room temperature. When cold, the insides are stiffer and won’t come out as easily. Blowing it Out: I figured there had to be a better way of doing this besides my own lungs. That is when I thought of a bicycle pump! So I gave it a try and it worked really well, but there are some things you will want to watch out for or you will blow up your egg. Which totally impressed the kids, but it was not really what I was going for. 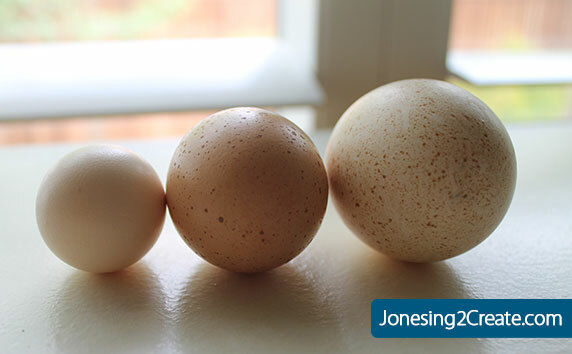 1) Look for eggs that have fairly thick shells. If the shell is at all translucent or has even faint cracks, I wouldn’t use it. Farm fresh eggs work best because their shells are a bit thicker. 2) Blow out the egg just a little first. I have found that the egg innards get kind of trapped in there at first. When you go at it right away with the bike pump, too much pressure builds up inside the egg. 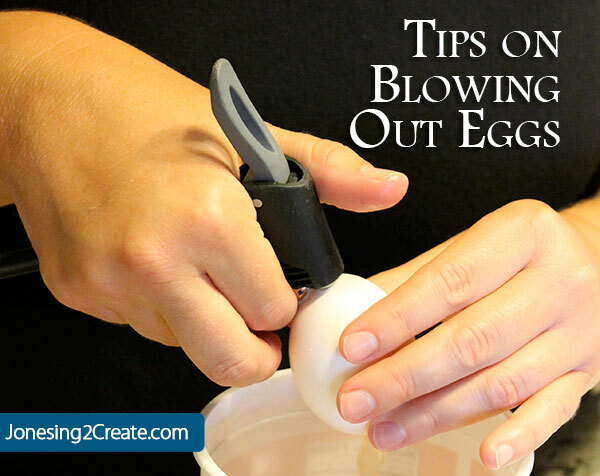 If you can clear it out a little first by blowing into it, you are less likely to blow up your egg. 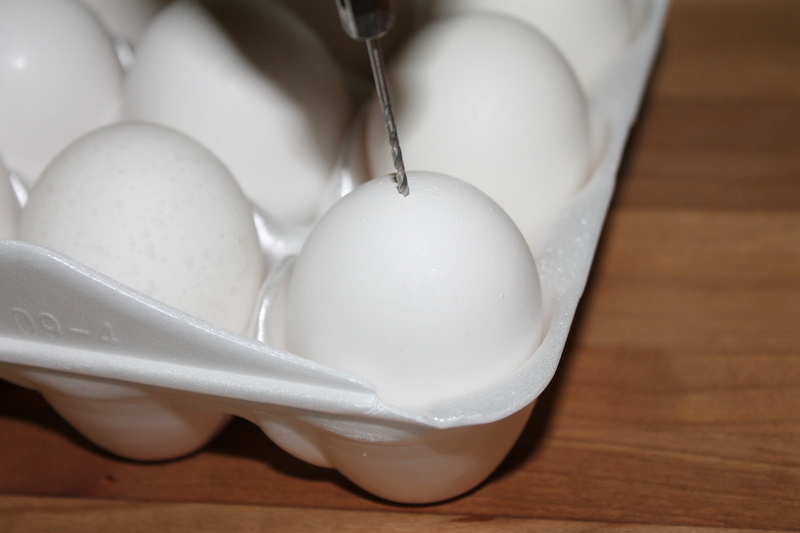 3) Next you stick in the metal pin thingy from the pump into the egg. I then push down very, very gently on the pump. You will want to do it just a little at a time. You can adjust how much air goes into the egg by using your fingers to create a seal around the hole in the egg and the pump’s pin. I was surprised at how fast I was able to blow them out and I didn’t get light headed like I normally do. I totally recommend using the bike pump if you have lots of eggs to do, but if you are only doing one, it would probably be easier to just use your lungs. After blowing out the egg, I filled the egg a bit with water and swished it around to make sure I got it all cleaned out. I didn’t want them to get stinky. 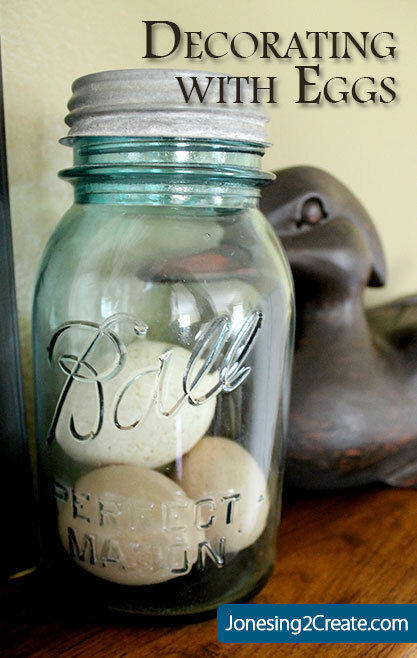 I then let the eggs dry for a few days and then I stuck them in an antique Mason jar. I love the way the blue of the jar plays off the brown of the eggs. I am totally obsessed with jars and sticking things from nature in them. You would think I was a reincarnated naturalist. I have jars full of sand, pinecones, shells, and rocks all over my house. I think I might actually have a problem. Luckily my husband doesn’t care. I think he is just glad my design tastes don’t run more expensive. I am also cooking up some more ideas on fun stuff to do with eggs and will post them closer to Easter. Now I just need to find more farm fresh eggs! But next time I think I am going to try this little tool . The reviews on it are great and you only have to make one hole in the egg. I have a feeling it might make my little bike pump idea look quite stupid. I’m going to buy one once I get started on my Easter decorations and I will let you know how it goes. I you can’t find any antique Mason jars or if you are looking for some that don’t cost as much, Amazon has some super cute ones for much less than what you will spend for the real deal. You can’t beat how cool the real ones look, but these do great in a pinch. Next story Genius! The Camping Solar Bathtub!